Trying to find the perfect party place for your kid’s upcoming birthday? You’re in the right place. Here at Big Air, birthdays are what we do best. We’ve designed everything to be easy on you, fun for the kids, and affordable. Take a look around this page to learn more about our award-winning birthday parties! Or if you’re ready to book, click here. Or, if you have any questions, give us a call at (704) 246–5233! Book | Once you’ve made your selection, it’s time to book! You can book online here, over the phone at (704) 246–5233, Monday-Friday between 9-5pm or in the park! Please keep in mind that all birthday events do require an advance reservation + $100 non-refundable deposit. Walk-up parties may not be accommodated. Invite | Once you’ve booked, you’ll receive a confirmation email complete with all the info you’ll need for a successful event with us. Once your RSVPs come in, we encourage that a guest list be sent to us as soon as possible. Also, all guests do require a liability waiver, which can be completed online here prior to arrival. Extreme Package | Two hours of play time in the park with full access to all attractions followed by a 40 minute reservation in one of our party rooms, pizza, soft drinks, cake pops, chips, a party host, and more! Super Package | One hour of play time in the park with full access to all attractions followed by a 40 minute reservation in one of our party rooms, pizza, soft drinks, a party host, 20 extra minutes of jump time and more! 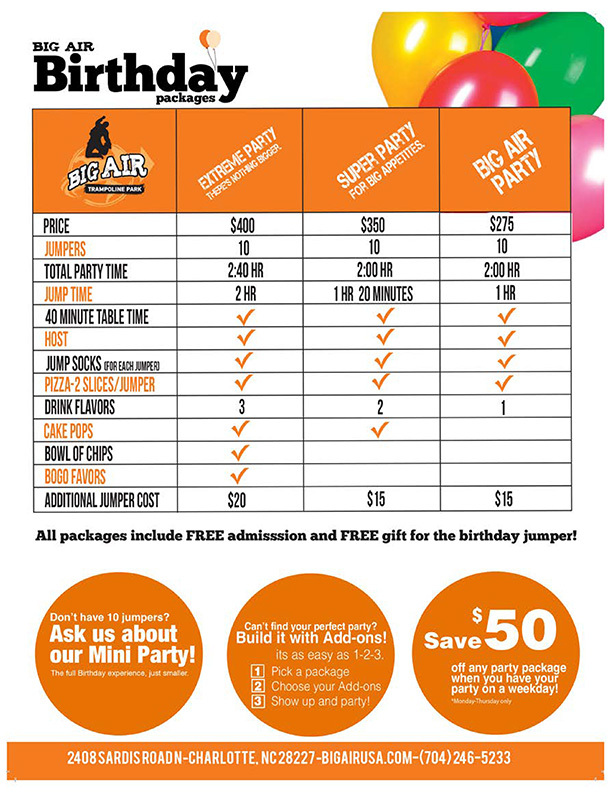 Big Air Package | One hour of play time in the park with full access to all attractions followed by a 40 minute reservation in one of our party rooms, pizza, soft drinks, a party host and more! Toddler Time® | Wanting to avoid the big kids? This package is for you. Taking place during Toddler Time, Tuesday and Thursday from 10:00am-1:00pm and now on Sunday from 10:00am-11:00am! This party package includes jumping, pizza, drinks and more! Our biggest, most extreme package yet! Two hours of play time in the park with full access to all attractions followed by a 40 minute reservation in one of our party rooms, pizza, soft drinks, cake pops, chips, a party host, and more! It is our Extreme Package with up to 20 jumpers! Starting at only $450, this is the perfect option for large parties with lots of energy! Save on extra jumpers and make the Extreme, Epic! Jumpers must wear Non Skid Jump Socks. Non-skid Airsocks are included in our birthday packages! Online | Our online booking system makes it easy to choose a date and package. To book online now, click here! Over the phone | Give us a call Monday-Friday from 9-5pm at (704) 246–5233! At the park | In the Neighborhood or enjoying our park already? Ask for a party coordinator and they will help get your party booked! MAKE YOUR PARTY EVEN SWEETER! Meat Lovers | Hawaiian | Veggie | $17 – A perfect addition to feed the hungry party parents! Lays® Potato, Lays® BBQ, Lays® Sour Cream and Onion, or Ruffles. A list of our most-frequently asked questions. Don’t see what you’re looking for? Give us a call at (704) 246–5233 and we’ll be happy to help. With any party package, our guests are welcome to bring Cake or Cupcakes and Bottle water at no extra charge. Anything outside of that is subject to a catering fee. No open flames, sterno, crockpots or electrical appliances allowed. Plan ahead for hot food. Yes! We supply all paper goods to include large plates, cake plates napkins, and forks too! Additionally, our party hosts are prepared with standard candles, cake cutters, and lighters. Absolutely! You are welcome to dazzle your party during your allotted time, however, we do not allow objects to be hung on our walls or party fences. Upon arrival, decorations must be assembled, and balloons should be inflated with an attached weight. Please no table confetti.